Gosper says it is a "very significant moment" because the sport risks becoming one of haves and have nots. "Everyone sees the merits of what we're doing," Gosper told BBC Sport. "Everyone sees that adding meaning and context to all of these matches that happen throughout the year is an exciting prospect." 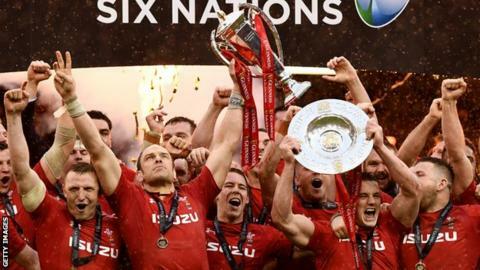 There is scepticism from some of the governing bodies of countries competing in the Six Nations, who are weighing up a rival offer from investment company CVC, which it is understood could be worth £100m to each union in return for 30% equity. Scotland and Ireland are reportedly unconvinced by World Rugby's proposal and are particularly unsure about the introduction of relegation from the Six Nations, which would be required if it became part of a global Nations Championship. "Generally where there's a bit of discomfort is around the issue of promotion and relegation," added Gosper. "That's understandable - many of these teams have been pretty well protected in closed competitions for a long time. "What we're asking is that some of that national interest is tempered by a little bit of concern about where the global game might be going as well. It's trying to find that balance that will be important if this is to get across the line." The former Racing and Australia U21 player underlined that the governing body's plan does not give away any equity - unlike the rival CVC bid. "It's about keeping the money in the sport and it's about making our own decisions about what's right for the sport, and you can do that when you have 100% ownership," he said. However, Gosper acknowledged World Rugby could have done more to reassure players about its plans. The international Rugby Players' Association highlighted "major concerns" about players' workload and travel after initial reports about the Nations Championship schedule emerged, and Gosper says World Rugby have responded to that in part by removing a semi-final from the calendar. He added: "I think we could have done a little bit better. I was surprised by some of the PR that came out pretty quickly from the International Rugby Players' Association. "We've had some frank conversations with them and at the time they came out against this they saw our position as fixed, whereas we were having trade-off conversations about possible scenarios." World Rugby stresses the financial benefit of its plan to all unions but particularly to enable them to invest in developing nations. "I think if there are fewer countries garnering all the wealth in rugby that imbalance would not be good for the general growth of the sport," said Gosper. "I think what's important is that all boats rise in some way and we provide a greater sustainable future for the maximum number of markets that we can and that's going to be more healthy for the sport for sure." Danny Care needs some help with the proposed World League. Chris and Ugo oblige. Meanwhile, Dr Christian Mueller, the vice-president of Infront Sports and Media, says the company was "blown away by the concept" of a new global competition and wants to co-operate with those running rugby union rather than impose any plan. Mueller told the BBC its offer allowed the sport to "keep control of its destiny". "We see ourselves as partners and as a service provider, not that we take rights and do whatever we want with them," he said. "I think this is the best way to approach markets and the best way to develop the sport and we have a long-term interest in developing the sport." Infront was founded more than 30 years ago and its owners say they have relationships with every sports broadcaster in the world and the governing bodies of 160 sports. It believes the proposed Nations Championship would allow rugby union to grow in new markets, such as Germany and the United States, as well as becoming a rival to football in global sports markets. "There is a lot of soccer out there," said Mueller. "I think there's a place for top international rugby matches all around the world. "I think there's an opportunity for true global growth and we are here to support that. "Of course, it is a difficult concept and it's change - it's moving into a new system. "We hope that, with our support, this change will be made. We will prove together with World Rugby and the unions that this is for the good of the sport."